Wood windows that last for more than 10 to 15 years after installation are rare. Unlike wood furniture, wood windows are constantly exposed to extreme temperature changes and moisture, and are likely to develop problems from such exposure. Are you having problems with your wood windows? If your wood windows are becoming increasingly difficult to open and close, it’s likely the wood has warped beyond repair and will have to be replaced. You may hear tips about sanding or slightly planing the sashes to loosen the them a bit, but that’s not a long-term solution. Also, if you find yourself having to scrape and repaint your windows often, and if cleaning them requires a lot of effort, then you may need new windows. Do your old windows provide comfort? Energy-efficient windows provide more than just energy savings – they also help keep your interior comfortable by maintaining a consisten indoor temperature. 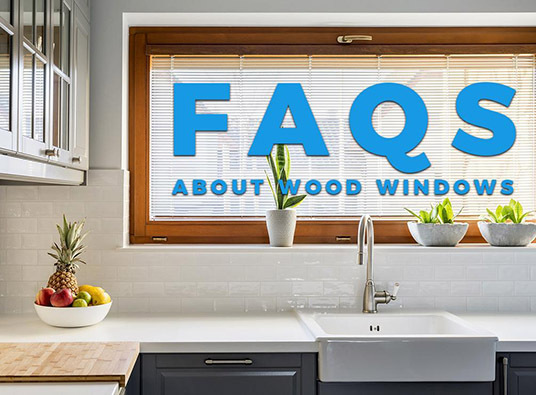 So if you’re experiencing drafts and condensation, or if your indoor space heats quickly from the sunlight that’s streaming in, then your windows aren’t doing what they’re supposed to do. Consider a wood window replacement soon. Are your wood windows worth the repair costs? Assuming you will have to spend money for window repairs (maybe the warranty doesn’t cover it, or it’s already out of warranty) how long would it be before you need to have the windows repaired again? If the cost over time is more than what it would cost for new windows, look for an alternative, like our vinyl replacement windows. What benefits would you get from new windows? New windows are more than just updating your windows’ looks but also their functionality. You can benefit from modern components like dual-pane glass, insulated frames and low-maintenance materials. Our replacement windows offer all these benefits and a whole lot more. To learn about what makes our replacement windows the ideal choice for wood window replacement, call Kroll Construction today at (888) 338-6340 or fill out our contact form to schedule a convenient time to meet. We serve homeowners in Detroit, MI and nearby areas in Michigan.